This area is your central resource for information on Nanotechnology and how to integrate it into your classroom activities. We realize that you already have much to teach, and that there is no room for activities and lessons that do not fit into the curriculum and standards. As such, we offer no big multi-week modules and units. The good news, however, is that there are aspects of nanotechnology in things that you already teach--basic Biology, Environmental Science, Chemistry, Physical Science, etc. And there are many ways to integrate nanotechnologyinto other basic activities such as reading. Our approach is to offer simple activities using nanotechnology that demonstrate important concepts that you already teach. Adding a bit of "nano" provides an extra hook to keep students engaged. And yes, some concepts in nanotechnology are accessible even to primary school students. Nanotechnology in the Curriculum- A discussion of how nanotechnology lines up with National Science Standards and the Common Core. Research Experience for Teachers (RET)- RET is a (paid) summer program that engages teachers in nanotechnology research while simultaneously developing lessons in nanotechnology for use in their classrooms. It is available only at 4 NNIN Sites for teachers in the Atlanta, Phoenix, Santa Barbara, or Minneapolis areas. Most of the lesson materials on this site were developed by participants in the RET program. 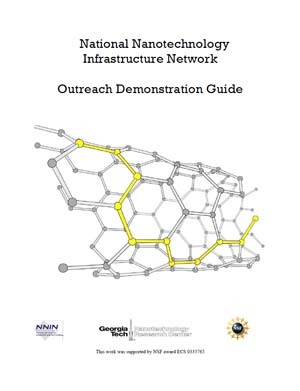 Guide to Nanotechnology Demonstrations - A detailed guide to some nanotechnology demonstrations, developed by the NNIN Georgia Tech Site. These are not full scale lessons, but rather 10 minutes activities. and lastly Nanooze, NNIN's "Science Magazine for Kids". Nanooze is avilable on the web in English, Spanish, and Portuguese, and in print in English only. Classroom packs are delivered free of charge upon request. This colorful and enganging magzine has proven useful as supplementary and enrichment material at all K-12 levels.